Taking your gear, your crew and your dog along for the ride? No problem. You’ll be surprised by Prius c’s cargo space, thanks to the 60/40 split fold-down rear seats: not just 17.1 cu. ft. of volume, 3 but also a variety of ways to configure it. Feel free to pack even more fun into every journey. Meet the perfect road-trip partner. With available Entune™ Premium Audio with Integrated Navigation4 and Entune® App Suite,5 Prius c ensure you won’t miss a beat. And with a standard 6-way adjustable driver’s seat topped off in an eye-catching two-tone fabric, you can always stay in your comfort zone. 4Be sure to obey traffic regulations and maintain awareness of road and traffic conditions at all times. Availability and accuracy of the information provided by the navigation system is dependent upon many factors. Use common sense when relying on information provided. Services and programming subject to change. Services not available in every city or roadway. Updates may be available from your dealer at an additional cost. See Owner’s Manual for details. 5Be sure to obey traffic regulations and maintain awareness of road and traffic conditions at all times. Apps/services vary by phone/carrier; functionality depends on many factors. Select apps use large amounts of data; you are responsible for charges. Apps and services subject to change at any time without notice. See toyota.com/entune/ for details. Enjoy more savings so you can create more memories. Thanks to its EPA-estimated 43 mpg highway and 48 mpg in the city,6 Prius c delivers a more efficient drive. Now you can pull over for more photo ops and fewer gas stops. 62019 EPA-estimated mileage. Actual mileage will vary. Take a charge and pick your perfect drive mode. 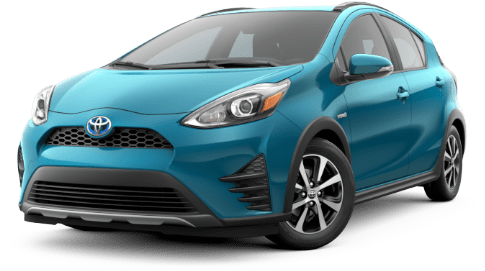 Prius c’s EV Mode enables electric driving for up to one mile.7/8 ECO Mode Limits the operation of the climate control and adjusts throttle input to help maximize fuel economy and give you more moments for each mile. 7CAUTION! When driving a hybrid vehicle, pay special attention to the area around the vehicle. Because there is little vehicle noise in electric mode, pedestrians, people riding bicycles or other people and vehicles in the area may not be aware of the vehicle starting off or approaching them, so take extra care while driving. 8EV Mode works under certain conditions at low speeds for up to a mile. Please see your Toyota vehicle Owner’s Manual for further details. 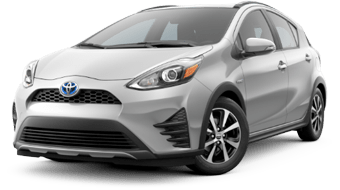 Rated as a Super Ultra Low Emission Vehicle (SULEV),9 Prius c produces fewer smog-forming emissions than an average gasoline-powered new vehicle. 9Meets Tier 2/Bin 3 Federal emissions standard. Prius c’s sealed Nickel-Metal Hydride (Ni-MH) battery10 fits perfectly in the space beneath the rear seats. It helps lower the center of gravity to improve handling and maximize interior space. Now you can get the most from every mile. 10Hybrid vehicle battery expected life is 150,000 miles based on laboratory bench testing. Get in and out of the tightest spots on your next getaway. Prius c has your back with its standard integrated backup camera11. Shift into Reverse and the largest display automatically shows what the camera detects behind Prius c, helping you avoid objects that might otherwise be out of view. It’s easy to unlock all the fun with available Smart Key12 fob in your pocket or purse. Simply grasp either the driver’s or front passenger’s door handle of your Prius c to unlock it. Plus you can start the engine with the push of a button and start your next journey with ease. Prius c comes standard with nine airbags, including a driver and front passenger Advanced Airbag System.13 In the event of certain collisions, a sensor designed to monitor the severity of the impact makes adjustments for the appropriate airbag deployment. 14Vehicle Stability Control is an electronic system designed to help the driver maintain vehicle control under adverse conditions. It is not a substitute for safe and attentive driving practices. Factors including speed, road conditions, weather and driver steering input can all affect whether VSC will be effective in preventing a loss of control. See Owner’s Manual for additional limitations and details. 15Brake Assist is designed to help the driver take full advantage of the benefits of ABS. It is not a substitute for safe driving practices. Braking effectiveness also depends on proper vehicle maintenance, and tire and road conditions. See Owner’s Manual for additional limitations and details. 16Smart Stop Technology® operates only in the event of certain contemporaneous brake and accelerator pedal applications. When engaged, the system will reduce power to help the brakes bring the vehicle to a stop. Factors including speed, road conditions and driver input can all impact stopping distance. Smart Stop Technology® is not a substitute for safe and attentive driving and does not guarantee instant stopping. See Owner’s Manual for details. 17Covers normal factory scheduled service for 2 years or 25K miles, whichever comes first. See Toyota dealer for details and exclusions. Valid only in the continental U.S. and Alaska. 18Roadside Assistance coverage is 2 years unlimited mileage. Does not include parts and fluids, except emergency fuel delivery. See Toyota Dealer for details and exclusions. Valid only in the continental U.S. and Alaska.